With no money to throw around and my little guy’s birthday next weekend I am on a mission to make winter dressing frugal and exciting! I mentioned last week how I was going to challenge and stretch myself by incorporating summer goodies into cool-weather style. So here goes . . . This floral Miss Shop dress will be a delight to wear in summer with ruffles all the way to the neckline. 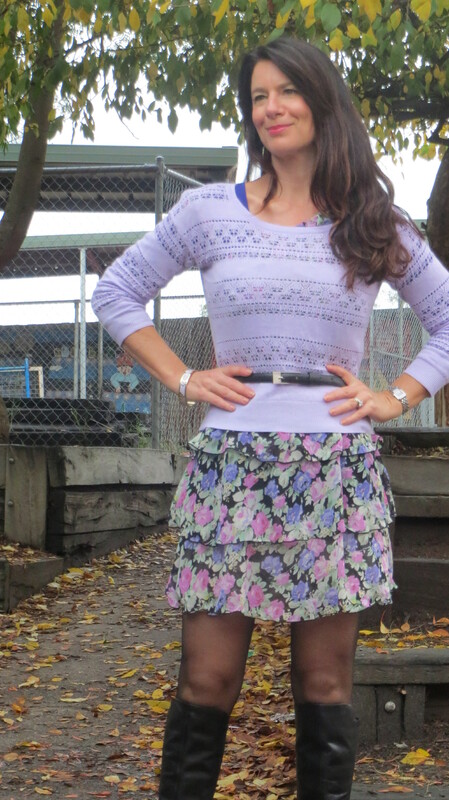 Meanwhile, here it is with winter layers – Valleygirl open-weave lavendar knit, Caroline Morgan purple top and Wittner boots. Toughened the look with a black skinny belt and threw on a black sequinned jacket. Hope you’re all enjoying the tail-end of the weekend. And now you’re Looking Good Girls! “Give, and it will be given to you: good measure, pressed down, shaken together, and running over will be put into your bosom. For with the same measure that you use, it will be measured back to you,” Luke 6:38.